28 weeks. Today is 28 weeks since your last journey. A journey mummy and daddy took with you. 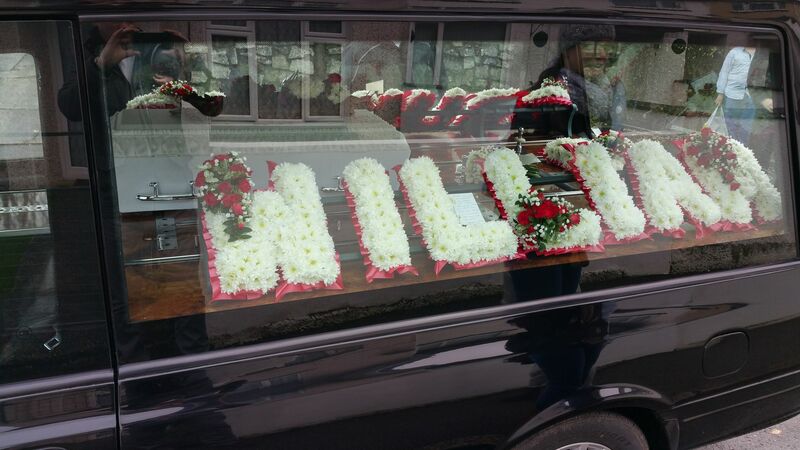 Mummy wouldn’t let you go on your own so she asked for a hearse that we could sit in with you. I remember sitting in your room, looking at the very spot you were last alive, and out the window I could see you coming. I shouted “William’s here”, the last time I would ever shout that, I ran down the stairs, opened the front door and watched as you were driven past. The hearse dwarfed your little coffin. Coffin’s should never be made that small. You shouldn’t be in one. Life is so unfair. 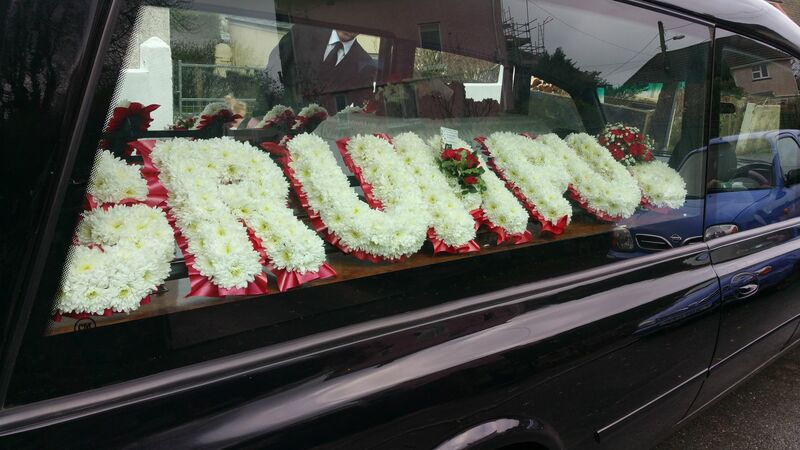 Your coffin surrounded by beautiful flowers spelling out your name, and your nickname ‘Grumpus’. There was a little pillow too, and sat proudly with you on your coffin was a little reindeer made out of flowers to match your favourite teddy and two red roses from mummy and daddy. To see your name in flowers took the breath right out of me as I stood there. Your name should be in lights, not flowers. It didn’t look right, how could it ever look right? You were so small. As I stood there trying to take it all in, I couldn’t, that was you in there. My baby, My beautiful little William, gone, never to walk up the steps to the front door, never to learn how to ride a bike on this very road where I was stood. At this moment I had no recollection of anything else around me, only total awareness of you. Knowing I couldn’t touch you ever again, knowing you were in that little coffin and I couldn’t see you. Mummy rested her hand on your coffin for the longest journey of our lives. The hand that fed you, played with your hair and soothed you when you were upset. Now all I could do was place my hand on your coffin. People were looking as we drove past. I could see the injustice written all over their faces, Their mouths forming an ‘O’ as their jaws dropped, shocked, no coffin should ever be that small, 30 inches to be exact. As we pulled up mummy climbed out and stood there, preparing to carry you for the last time. With daddy and your two nanny’s I carried you sweetheart, I carried you in to your own funeral to the words of Gordon Garner’s, Heaven Got Another Angel the words resonating through my body. Mummy read two poems and a letter that she had written for you. As I stood there the only presence I could feel was you, only you were in that room. I have no idea how I managed to do that, but I had to, I had to do it for you. Mummy would do anything for you, it was the very least I could do, to be able to stand there and make sure you knew how much we love you. Did you hear mummy reading, I hope so, it was for you. I wanted to write this post because it is impossible for you unless you have had to say goodbye to your child to understand the depth of pain I am experiencing. 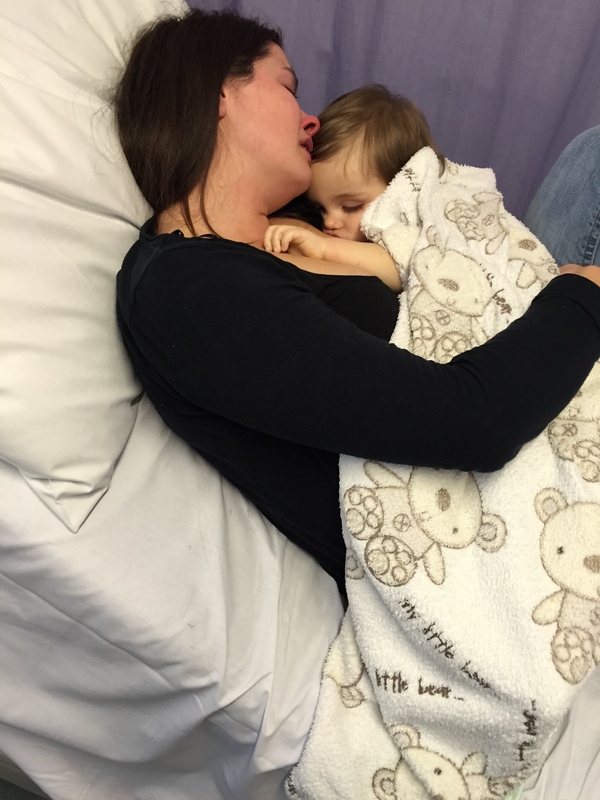 After you had been through this, held your precious child in your arms, begging him to wake up. Would you be able to live with it, because I sure as hell can’t. It’s easy to say ‘God only takes the best’ but you wouldnt say this if he’d picked yours. I am falling apart, desperately struggling, treading water to stay afloat, waiting for the right time for mummy to spread her wings and fly away. I have pondered over whether to show you this photo, this was taken a couple of hours after William had passed away, but he is still my little boy and this is part of our lives. So you see, please after 216 days, if you had been through this, held your little boy and fought for breath as you cried your life away you would understand that I feel no better today than I did when this photo was taken. In fact I feel worse, this is a life sentence. My life sentence. This is what grief really looks like. This entry was posted in Child Death, Child Loss, Depression, Grief, Loss and tagged child death, child loss, death, depression, funeral, grief, loss by amotherwithoutachild. Bookmark the permalink. Thank you, Melissa, for sharing your heartbreaking thoughts with others. No words are good enough to express how we feel. William is a beautiful angel. A beautiful, brave, heart wrenching article. Life can be so unfair, I hope you find solace going forward. Prayers for you dear mama. I do know how you.feel. I just loss my only child Tony April 18th 2015. ..exactly 3 months ago today July.18th 2015. There are no words… on loo y hugs and prayers. I feel like there is not much life for me. From one mom to another mom I understand. I am sorry for your loss. I am so sorry. I lost my son Kyle, forever 21, on April 27, 2014. Hardly any thoughts in my head are not about him, my memories, his childhood, teenage years, young adult, and death. I too sat with his body long after the doctors said he had died a brain death, I stayed until the next day when he was taken to be an organ donor. I too am treading water, ready to let go and be with my son wherever that may be and also holding on to this life without him, I don’t always know why but yet I stay. Your baby is beautiful and your face is a face of ultimate love and ultimate loss. It is my face. You are not alone is all I can say, it is only a small comfort. I know. This sounds like you are contemplating ending your life. I completely understand but I do hope that you are talking to someone who can help you deal with your thoughts before they become actions. You have survived through 216 days for a reason. Think of those reasons and talk to someone, talk to anyone. Your grief is palpable. Be strong and be safe. Ugh girl, your pain and how you express what you’re feeling and going thru without your precious baby boy by your side is one that haunts the deepest and darkest parts of my soul. Every fear and thought I’ve had if I were to not have my son with me in this life has been checked off in every one of your posts. I’ve read and cried pretty much over every post you’ve put on here and I think how strong of a woman, a mommy you must have to be to let yourself be so open and heartbreakingly honest with all of us whom you are letting in to get a glimpse of the very special, loving relationship you and your baby bear shared. I think you are a very brave woman for still being here in what has to be only as I can imagine a living hell nightmare and to be able to continue writing of your thoughts, your pain and your saddness, well just shows what a mothers love can do and how the love of one little man that adores his mommy can make you stronger than the strongest but weak in the knees. You are and will always be brave and strong because of the bond you both share, no matter where this “now” life takes you, whether it is here or flying high with your baby boy by your side, he will be with you every step of the way. You will find your path someway ,somehow with the strength and bravery and love for William that has carried you here and it will carry you wherever it is you need to go next. Always you both are in my thoughts and prayers. Bless you and your sweet baby boys little heart. I have read all your posts, they all hurt a lot, but I always read them, often more than once. It is difficult reading but I always come back. Your words are so powerful. I can not imagine. I don’t know what to say.. Yes, that is exactly what grief looks and sounds like. I wish I didn’t know this but I do. Stay strong Melissa, William will be so proud of you. Bravo to you for writing this. The life after one loses a child and the depth of indescribable grief is not easy to put into words. You have done an admirable job. My hope and prayer is, as those of us who have lost children continue to speak, that it will foster an atmosphere of patience and compassion for those who have gone through the greatest loss imaginable. No one can truly understand unless they have walked in our shoes, so I would not truly wish full understanding for anyone. But kindness, patience and a desire to learn are great treasures. Hugs. I’m sorry. I wish I could take your hand and tell you how much I understand. The pain physically hurt. You are not alone. I hope you have someone there with you through these dark days. Keep reaching out and sharing. A “life sentence” … that really is what this is. has no sap or colour. It has no flower and no fruit. It waits for the sun to find them. for dawn to make us clear to one another. Beautifully written but so crushingly heartbreaking to read. Every mothers worst nightmare. To share your agony so poignantly will I’m sure comfort others. I hope one day you find peace and be able to smile at the wonderful memories you have of him. This post has me wracked with tears. I losty daughter, Zora Danae, three days ago to infection and necrotizing entercolitis. She was 16 days old, born 15 weeks early at 25.5 weeks gestation. I am still trying to come to some kind of terms with everything. I have moments where I feel I am going to wake up from this nightmare and find that I am still pregnant with my feisty little girl, my warrior princess, and other moments where I expect to wake up and head to the NICU where I have spent so much time at my daughter’s bedside as she fought so hard for her life, only to be overcome by infection. We loved her so fiercely, and she is so overwhelmingly missed. Thank you for being brave enough to show the world what losing a child looks like. My older two children, 17 and 15, have been stunned by the loss of their little sister, and have become all the more dear to me for learning so brutally exactly how precious their lives are. My worst nightmare has come true; I have lost one of my babies, and there is no way to overcome or move past it. We simply carry the unbearable pain and grief with us, those horrid emotions swirling in the gaping hole in our hearts. I pray for you to find some kind of peace, and a softening of your pain and greif. Never give up. They fought too hard for us to not honour their fights by giving up. I cling to that in my darkest moments. You can make it. Hold on. Gods bless you. Thank you so much. It is very much surreal right now. I do plan on re-starting my blog, but right now I’m trying to just keep swimming and move along through each day. It’s so very hard, and I want her back so badly it’s unreal. I sleep with her blanket each night, and have been reading journals and support groups on FB, trying to get the courage up to call about face-to-face support groups. I don’t know if I’m ready for that. Thank you. Right now, I’m sticking with dominantly online support. I have my NICU therapist that I was seeing while my Zora was still with us, so I still talk to her weekly. I saw primary care doctor (PCP) this week, and she prescribed some medications for me, both long-acting and immediate-release type things to help me cope with things and balance me out a bit without making me a zombie. I also plan to start seeing a one-to-one therapist soon. I keep feeling a stronger and stronger urge to re-start my blog, so my goal for the next week is to do that: get that first entry posted and move forward from there. Eventually, I may reach out to the bereavement groups I have information on, but I’m just not there yet. It still feels like a bad dream, something I will wake from soon. Thanks for the support. I’ll be following you here. My blog is called I, Writer. The link is subjectivesurreality.wordpress.com.